Beverly Marsh drenched in (fake) blood? It can only be the latest set photo from It: Chapter Two. The New Line horror sequel is currently in the final stages of production as it prepares for a primetime release in September of 2019, and with big-name stars like Jessica Chastain (Marsh) and James McAvoy (Bill Denbrough) already moving on to X-Men: Dark Phoenix, it’s only a matter of time before writer-director Andy Muschietti has arrived at a finished cut of It: Chapter Two. 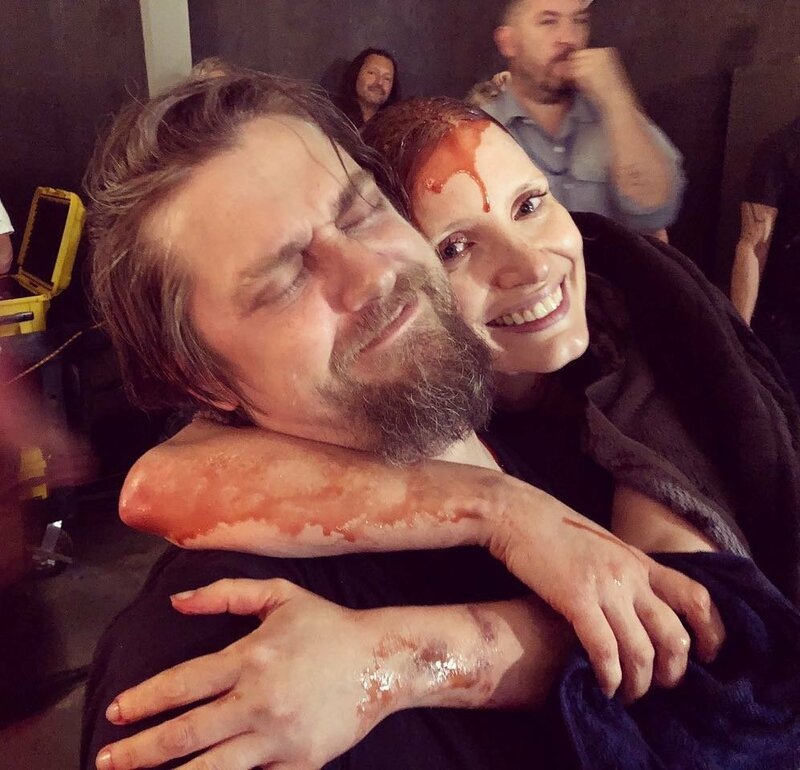 Until that day arrives, though, the filmmaker has served up the next best thing – a new set photo of Jessica Chastain as the adult Bev draping her arms around Muschietti, despite the fact she’s smeared in blood. It’s all in good fun, of course, as Chastain and Muschietti previously worked together on the horror hit Mama. She’s not the only actress tasked with playing Beverly Marsh, of course, as Sophia Lillis is expected to reprise her role as the young Bev during the inevitable flashback scenes. It’s all part of Andy Muschietti’s strategy to honor the original Stephen King novel, which itself spanned across two different eras as the Losers fought off Pennywise the Dancing Clown, eater of worlds and destroyer of dreams.